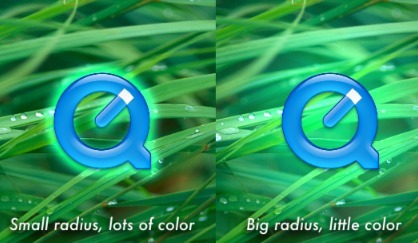 When applying a glow or a drop shadow, you usually have to decide between size and color. Small radius is too cramped, big radius is too transparent. Maybe you want a big radius and will just ... duplicate that glow layer one or two times, giving it that extra color boost you're looking for. You have to do this because the image editor works in 8 bit and can't boost the image without some overflow. But Core Image changes that, as it works in 32 bits per channel. It becomes a simple matter of multiplying the alpha of the blurred image ! Going really overboard on that last one :) Check out the Quartz Composer sample.